For the first time this fall our trusty Hound Truck Driver, Jenn Fuller got to ride in the field. Luckily she picked a great day to do this because it was another perfect fall day — the weekend heat wave was over and the temperatures were in the low 60s. Seemingly overnight the trees have started to turn and are now entering their full glory of golden yellows and bright reds. Noel Estes led the first field up until the check. At that point, she retired and Marjorie Franko led the second half. Debbe Kelley led the hilltoppers and Rhonda Watts Hettinger and Lori Baldwin whipped. The hunt started with a long gallop. It settled both horses and hounds and got us all off to a good start. By the time we slowed to a walk, we had a tremendous view of the hounds working the scent in the woods right off the main trail. During the first run the hounds gave amazing tongue. This was the most “music” that I’ve heard this season and it was delightful to follow. 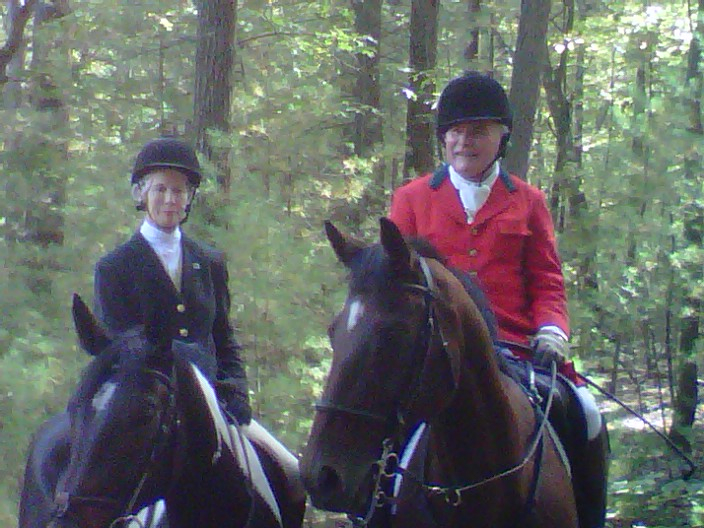 Freedom felt great and, in a nice change from Saturday’s hunt, his brain was engaged and he was listening to my aids. Instead of bouncing in place and flipping his head he was relaxed and forward, but obedient. The first series of jumps are small and when he isn’t listening to me, he can get too fast. I rode at the back of the first field so that I had the chance to keep him balanced. There are about six jumps in that first run and he took them in stride and went right to the base. It was the best that I’ve felt him jump since he was diagnosed with Lyme. The second cast was into the woods by Fairhaven Bay. It’s right next to Walden Pond and the trail system takes you over to the lake and to the replica of Thoreau’s cabin. It’s still a very peaceful place where you see only a few people on the trails. I think on Tuesday we had the woods to ourselves. 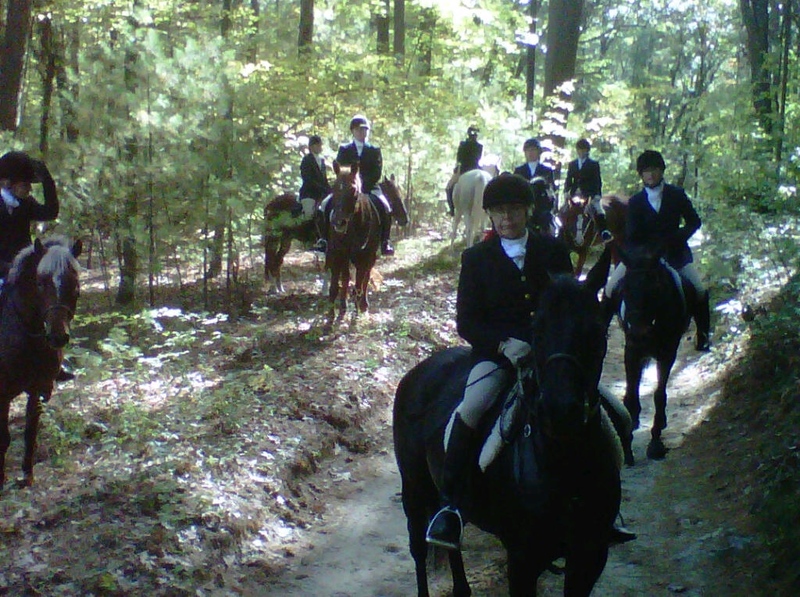 Happy riders after the hunt. 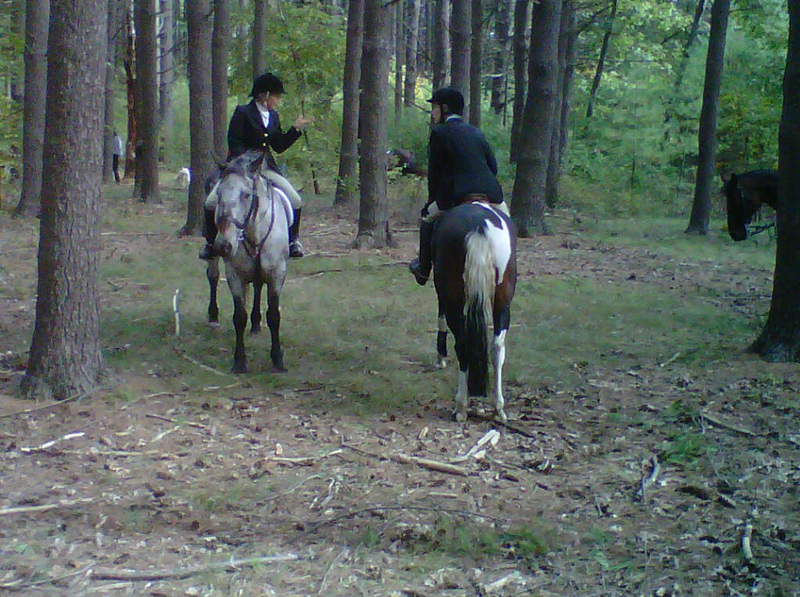 The second cast of the hunt took us over the larger fences in the territory. Our first field took them with aplomb. Once again the hounds gave great tongue and the pack finished up almost complete. The aptly named Diva was the last to come in but eventually she also turned up. Happily, there were also no bees. On Tuesdays our tea is a tailgate but this one was exceptionally well stocked. With several kinds of salad, cheese and crackers and a cake there were no complaints — except that we all had to go back to work!